Good day all! A couple weeks ago I went to KAABOO, an arts & music festival in Del Mar, California. I enjoyed the amazing experience with my boyfriend. I received a photo pass so I could bring my camera into the festival, which you'll see in these outfit photos. I also took some artist shots you can check out here; I captured bands such as No Doubt (Gwen Stefani), Minnie Driver, Slightly Stoopid, & more. Stay tuned for more updates on that! But at the end of the day what is a festival without fashion? Festival fashion is half the fun. This is what I wore on day three. Looking back I was tropical all three days; Del Mar is the perfect place to represent. It's near the beach. There are palm trees. It's sunny & warm. You can't go wrong. I'm all about tropical print inspiration. This is a low key, laid-back look. Much like myself. 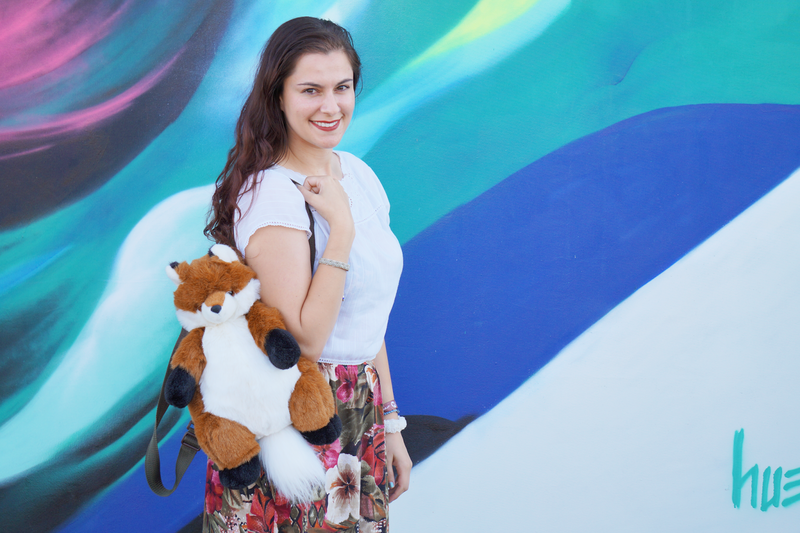 The outfit features a cameo from my childhood backpack whom I've named Fox Mulder after The X-Files character. I've truly had this backpack for longer than I can remember but I don't know if I've ever used it because it was spotless. Clean as a whistle. I like looking back at items I've had for years & finding a new love for them. There are couple types of people to go to music festivals. Those who are there to be seen & get their photo taken. Then there's people like me who just want to make it through the day without dying. I did a mixture of cute & comfortable. I've stressed the importance of comfortable shoes at music festivals so many times! It's vital! Shirt: Thrifted // Skirt: from my grandma // Socks: Rue 21 // Shoes: H&M // Backpack: ??? My KAABOO OOTD is super affordable; I love going thrift shopping because you can find some unique & funky pieces for cheap. 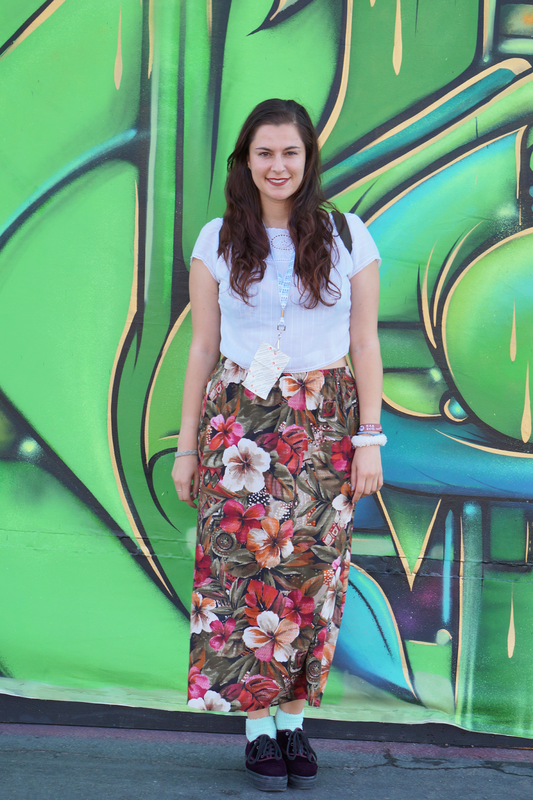 I acquired the skirt from my grandma's closet when she passed away; check out another outfit featuring some of her items here. My shoes you may recognize from this outfit post. I firmly believe you can never go wrong with velvet. Or creepers. 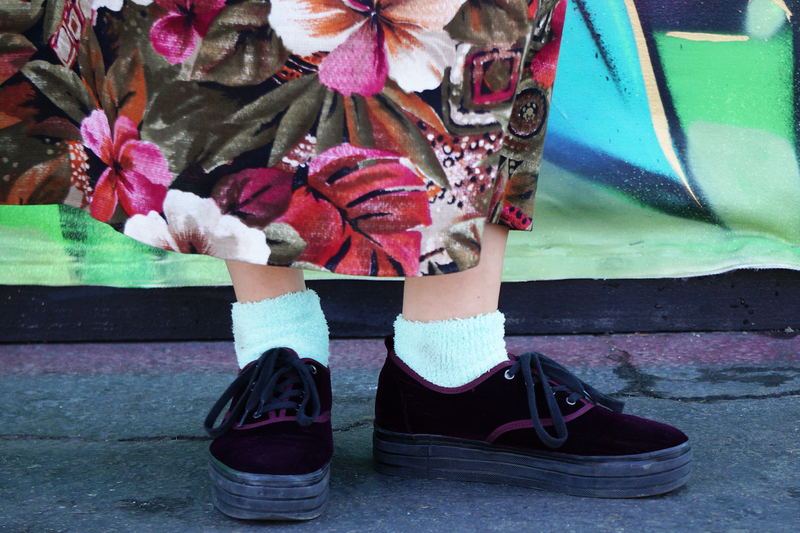 Or velvet creepers. Beautiful skirt, love your look. I have never heard of this festival before. You photos are amazing I especially love the one of Gwen. How long have you been a photographer as you are seriously talented? I love the bold print in the skirt! Love this look! The velvet creepers are amazing. Hope you had an amazing time! I'd love to see No Doubt someday. No Doubt was seriously fabulous. It was amazing to see Gwen live. I love your skirt! The colours are so pretty! such a cute outfit! Love that bag!! So freaking cute! Pretty skirt and your fuzzy socks are the cutest!! That bag is sooo cute! I love velvet! Especially for fall, it's the perfect fabric. That backpack is too cute, definitely eye catching, and it's great that you received a photo pass! One of my favorite things is to look back on old photos. Such a nice look, especially with the shoes!! 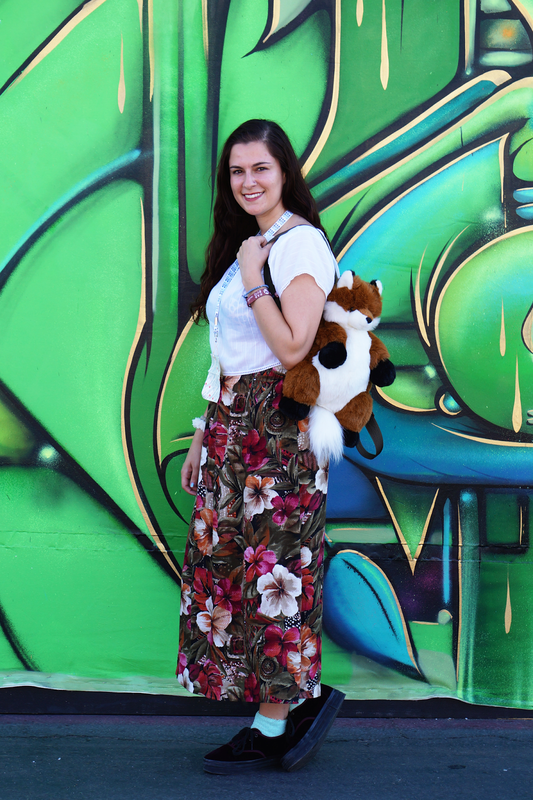 this skirt is gorgeous and love the cute fox backpack! So jealous of you seeing No Doubt! I have loved them for so long. Looks like you had a fun day, love that skirt too! Nice!! Heard it was a blast (since I'm from SD too). Cute look!! 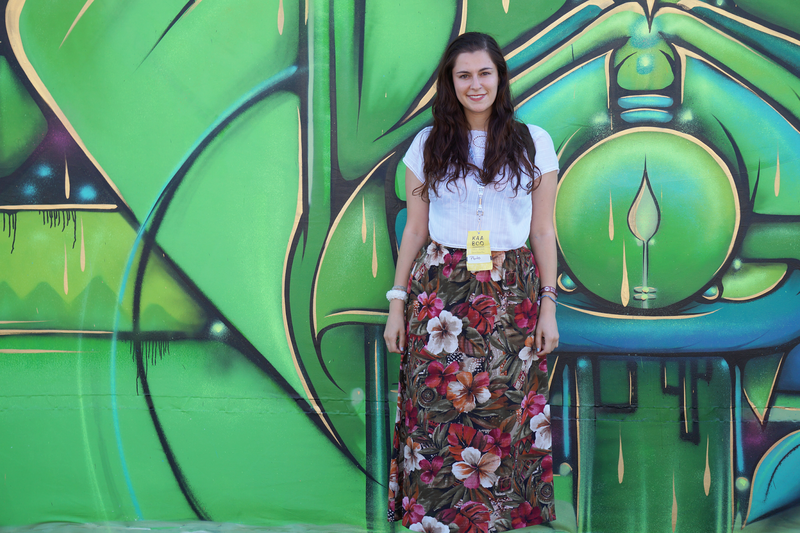 Love the colorful wall and your skirt! such a cute fluffy bag! 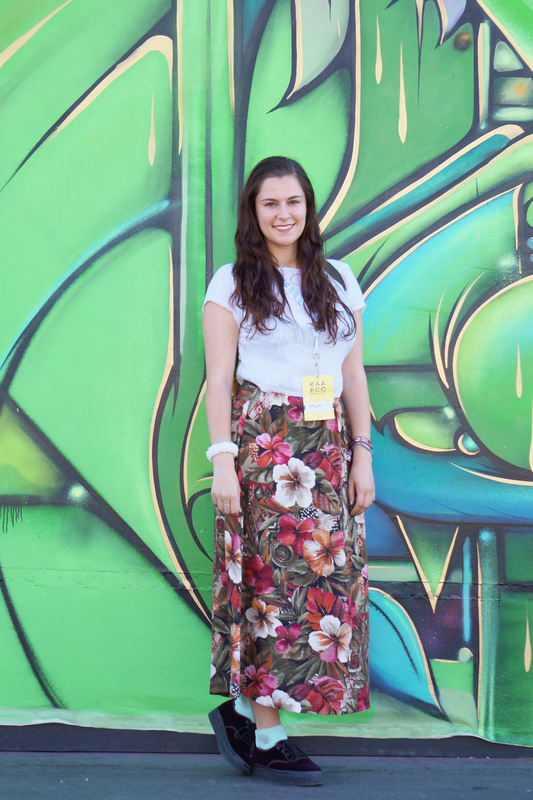 Beautiful pictures, love the print of your skirt! Love this look! 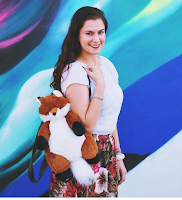 The foxy backpack is so adorable!!!! Such a cute bag!! I love the skirt! what a fun look! Love that skirt anf your backpack is the cutest! Glad you had a good time! I love festival fashion. I love the outfit! You look soo pretty!!! I hope you had fun! That is the cutest backpack! I remember having a stuffed animal-style backpack just like that when I was younger! haha. So fun! Glad you are finding a new love for it. It's always great to find a new life for old things.